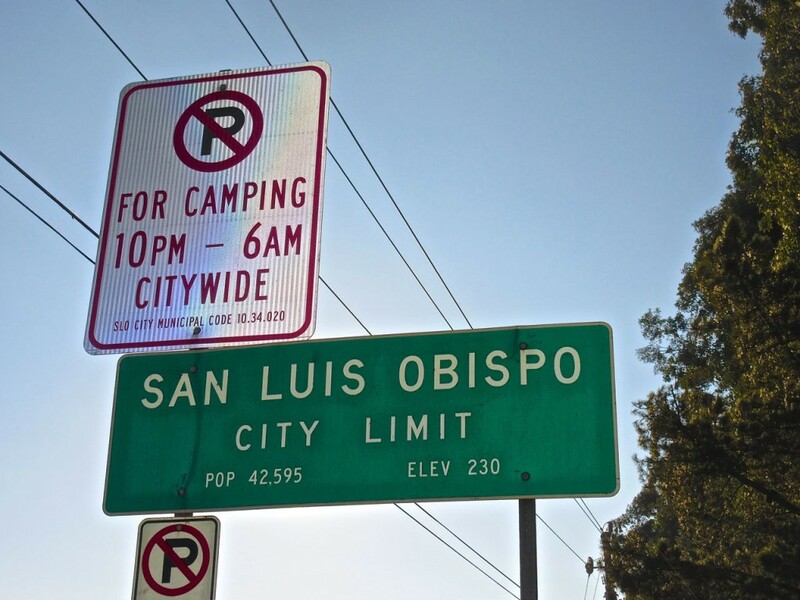 The sign that greets visitors to our community gives a subtle warning to the homeless that they can’t sleep in their cars or RVs on the streets of SLO. Otherwise, they will get a ticket. Where can the homeless go without getting ticketed? Until our government has an answer to that question, they should instruct law enforcement not to ticket the homeless for trying to sleep. Across our nation, laws that make it a crime to not have a place to live are spreading. In the city of San Luis Obispo, they are already here. We treat stray dogs better than we treat our homeless. I have had homeless people tell me they would love to live in one of the dog kennels at the local humane society, where they would have a safe, secure, dry, clean place to live. Clearly, there are not enough shelter beds. Even if there were, our shelters don’t admit those who drink, curse, have a drug addiction or mental illness, or even a pet dog. Many of our homeless are children, veterans or the elderly. In this relatively affluent community, we should be able to find a way to shelter and feed everyone. There are affordable, un-subsidized solutions out there, as I have written over and over again in other articles. There simply isn’t enough money to subsidize affordable housing for all who meet the criteria (homeless or low income). Unfortunately, the government officials I have met with have ruled out all “common sense” solutions to housing the un-housed and creating affordable housing. Tim Waag has lived in San Luis Obispo since 1992. He manages a law firm and donates time to multiple homeless services organizations. Which California representatives talk the most? Homeless people are obviously not the problem. They are the end result of the problem. So I was browsing the current rentals in SLO county, and I thought I would share them for your viewing pleasure. Most of them are so expensive I have to joke about them. If you don’t like to click links, I will summarize them below. No wonder people are living in the creek beds! This first link is for a one bedroom studio apartment in BEAUTIFUL Paso Robles! It appears to have been tastefully remodeled as well! Now this one has a bargain price tag of $875 per month and allows a small pet with an additional pet deposit. This apartment requires the applicant to earn three times the rent in earnings per month ($2,625), or this bad boy is not for you! That excludes a lot of our seniors on fixed incomes and our struggling low income wage earners that might be debt free. They are calling this one a “penthouse”. Ooooh. Looks like a townhouse to me, but I’m not fancy like and from Oceano. This is 2 bedrooms and 850 square feet. This is in a flood zone, next to a skunk breeding ground and a really loud train and the sheriff’s station, AND this is where all the sanitation scandal is happening. But as the renter, YOU don’t really care! You could go sit in the meetings for free entertainment though, which is a plus. No smoking, no section 8, no pets, no cosigners, no housing assistance. Now THIS is a sweeeeeet deal. A 2BR house is ATASCADERO!!!! A HOME. For the bargain price of $1,450!! And people say SLO county is expensive!!!! There is just no garage. And no washer/dryer hookups. But you CAN have a dog/cat for a $550 deposit. But you better not have glaucoma or cancer, because you CANNOT have medical marijuana in THIS HOUSE. Or smoking or vaping. Or section 8. OMG finally!!! A place in SLO that is NOT for Frat people. YES!!! 2 bedroom, 1 bedroom HOUSE for 1,600 a month? What!!??? Is this a place for a nice professional family starting out with a child? NO. This is a 2 BR home, but has 3 total homes on the property. This rental asks for 2 ADULT tenants in the 2 BR home. $1600 deposit, $1600 monthly with a year lease. The homeless issue is a complex one. Some others have already touched on some of the issue/barriers/challenges to assist the homeless. There are policies in place locally that disallow our homeless with substance user and those with untreated Mental Health issues to stay at the shelters. They are deemed to disruptive to other residents and those with families and children. Some homeless are resistant homeless; they choose to be homeless. These are the young men you see out and about. Some do not want to work. They are avoiding child support, some just enjoy the Peter Pan lifestyle. It is estimated 20% are resistant. You have another segment of the population that are the drug abusing/mentally ill population. Then you have another segment of the homeless population, the families, that truly want to be housed. Some of the families have past drug felonies, and this prevents them from qualifying for subsidized housing. Some have very bad credit and no/poor references. Some of the families have had housing and lost it before. Some of the families are waiting on very long waiting lists. There were some really nice senior affordable housing built in Morro Bay for 62 and older, and different units had different scaled rents based on incomes, which were posted online. What I DID hear is that they interviewed quite a few people, and that they rejected an elderly woman sleeping in a tent, but gave an apartment to someone from out of SLO county. “They” is People’s Self Help Housing or HASLO. So, my point of this example is that there may be some decision making in place that is “flawed”. The idea of building affordable housing is to get SLO residents off the streets, not to import people from other counties…. To pay their fines, guess what homeless persons can do? CLEAN/PICK UP TRASH!!!! Community service? Pick up trash! Over 50% of Americans are one paycheck away from homelessness. Stay humble. “Central Coast RN”, thanks for the intelligent discourse on the homeless problem. The VAST MAJORITY of those who appear to choose to be homeless, don’t actually WANT to be homeless. I know many of these people and have spent significant amounts of time with them. There are exceptions, but these folks will eventually admit that they would prefer to have a roof over their head and warm dry bedding and a safe place to lock up their belongings, but have a difficult time coping with the many demands of modern life. Just one example: I hired 2 homeless people to paint a building. One of them had been homeless for about 25 years, but still had 2 kids during that time. He is a professional commercial painter. He admitted that he just couldn’t hold a job where people “told him what to do.” In that situation, he would conflict with his supervisors when he disagreed with them, and thus, he “chose” the vagabond lifestyle. He would prefer to be housed, but that lifestyle resulted in fighting and conflict, so he avoided a traditional lifestyle for that reason. With counseling and a proper working situation, who knows? He certainly did a great job painting! Plus, he WANTED to work, yet uninformed observers would say that he “chooses” the homeless lifestyle – not true. And no, the homeless cannot get a job picking up trash, because, with their felony records and citations, nobody would hire them – public or private employers. IMO, trash is a symptom of the problem, not the problem itself. Surely, you are not suggesting that if the homeless mother with a few children who are living in the creek bed would pick up her trash, then all would be well? The homeless AVOID DETECTION and thus do not want to be seen hauling trash bags for miles to a dumpster. I have tried to offer up a trash collection service at the various homeless camps around town, and there has been resistance, because any and all additional visitation creates unwanted attention to their illegal living situation, and perhaps, citations and confiscation of their “stuff”. Again, I do not understand the logic of ticketing people with no money and “down on their luck”. They end up in jail for just trying to live, with citations that they will never be able to pay, and a record that will keep them from ever finding employment. Plus, if they have a vehicle and insurance, they lose both and become even more of a burden on the public. No, ticketing is NOT necessary. You won’t see too many moms with their kids not in shelters. Not for long. If moms are out in creek beds mentally ill and using drugs, their kids will be removed. Adults have a constitutional right to be crazy druggies living in a creek bed, but children have a right to a safe place to sleep, warm, and some routine with regular meals and clean clothing. The chances of that happening in a creek bed filled with trash aren’t very likely. You and I agree in quite a few areas. Where we differ is that while people have a right to their beliefs, they do not have a right to leave their trash and garbage strung about indiscriminately, which is indeed what is happening because I have SEEN it. We have a needle exchange program in SLO county. Will they have the courtesy of picking up their nasty heroin needles so someone’s CHILD doesn’t step on it or pick it up at a park? Nope. They are too busy for that. Now, I WILL admit, there are some cities and towns that had it ALL wrong. Example: the park in Oceano, I call it the “Oceano duck pond park”. I know it has a real name, but I don’t know what it is. On one side, there is a pretty decent park with a pirate ship like structure, swings, basketball court, sidewalk all around, bathrooms. Across the street is the “duck pond”. Across the street from that is a small camp ground, and down the road is a place you can camp some more. Now, it wasn’t too long ago, like within a few years, that there were no trash cans in any of those parks. I saw a parks employee there, as I wanted to throw something away. He told me that it was a waste, because the homeless people would just fill it up. So instead of putting the trash IN A TRASHCAN, parents and people like me (and the worker) were picking the trash up. I handed him a really gross bag with cigarette butts and another lady showed him some cans made into weed smoking devices and someone found a needle. The park now has trash cans. The thing about human behavior is that study and research shows that if there is no accountability for one’s actions or perceived fear of a consequence for one’s actions, then why would anyone stop bad behavior? If the homeless population knows that they can just throw their trash anywhere they want with no consequence, why would they stop? Maybe if they homeless gets general assistance relief. on an EBT card or SSI, and they get a ticket for just tossing trash everywhere, then their funds get turned off until they do 3 hours of garbage clean up and their ticket gets signed off. They can go to DSS and their card gets turned back on. It doesn’t have to be a ticket that is attached to their car that would mean an impound. I understand how that is crippling to their livelihoods. Here is where I WILL concede. I don’t think ticketing should happen until the homeless are given an alternative space. Board of Supervisors needs to just look at a map, put some hippie beads around it, dub it “Boho zone” or something, and make sure it has the amenities homeless people need. They need to make it happen ASAP. After that happens, no more trash in creeks no more panhandling and punching SLO residents, and shenanigans. “Central Coast RN”, again, thanks for the intelligent discourse on the homeless problem. You may not see too many moms with their kids not in shelters, but I do. Come with me and I’ll show you. 300 children are homeless in SLO County. 150 shelter beds in SLO County, including ADULTS (not just children). Do the math. Numerically, it is not possible that all KIDS are getting sheltered – so where are they? In the creek beds and under the overpasses. The homeless try NOT TO BE SEEN (it’s not that hard here, because there are lots of places to hide). Yes, we do agree in quite a few areas. My main issue regarding homelessness is with folks that somehow believe they deserve to be homeless and should be ticketed, arrested, and put in jail to rot, or be forced through city laws to leave and become someone else’s problem. The homeless are here, their numbers have been growing over the years and they are not leaving. It is up to us, the good people of SLO, to lend a helping hand. The rich won’t do it, because they are too busy trying to make more money. The poor won’t do it, because they are barely surviving. That leaves us – me and you. We have to decide if we are all brothers and sisters, and if we are “our brothers keeper”. I think we are. Regarding trash, “Central Coast RN”‘s example makes my point. The government employee told you that it was a waste, because the homeless people would just fill it up. Wait, isn’t that the point – to fill up the trash cans for disposal, rather than littering? The government is culpable in the real life scenario that you described. That scenario is what is happening in homeless areas around our county. What law says we can’t put trash cans and trash collection service at the homeless camps? Gee, then maybe they couldn’t criticize the homeless for littering – one of the main complaints. Question: Should they desire to do so, where could the homeless dump their trash? Answer: Nowhere. Throwing it in dumpsters they do not own is against the law. How many miles would they have to walk to illegally dump their trash in someone else’s trash can? There are no legal places to dump trash in SLO, to the best of my knowledge. Please prove me wrong. Where would Cal Poly students dump their trash if they DID NOT have curbside trash pickup? You think they would carry it for miles and dump it illegally in some businesses’ dumpster? Boy, would those businesses howl and complain (and rightfully so). Cal Poly students routinely dump unwanted furniture in Prefumo Canyon (just outside SLO but in SLO County) near where I live. How about criticizing them? Ask the county how often they have to pick up discarded couches and diswashers from Prefumno Canyon. I can’t tell you how many times we have called the county to notify them of illegally dumped furniture, garbage and building materials in Prefumo Canyon – I doubt the dumping was done by the homeless. (I ride my bike up Prefumo Canyon many times each year, and see all the dumping). Wow. “Central Coast RN” still thinks that you can ticket the homeless until they become housed? Describe a scenario where ticketing them puts them in a better place to get jobs and housing. “Central Coast RN” gets another thing right. Among our government officials, there is absolutely NO SENSE OF URGENCY, WHATSOEVER. It’s like the saying, “Nero Fiddled While Rome Burned”. Rome is burning. The homeless I speak to laugh almost uncontrollably about our ridiculous “10 year plan to end homelessness” – they need a place to sleep TONIGHT. They tell me: “In 10 years, they’ll probably be dead” (perhaps that was the law makers plan all along?). The thing about those living in the creeks, rvs, sidewalks and parks that is so hard if that it is not a fixed problem. There isn’t even an easy way to describe what is going on here, let alone find a solution. If you can’t identify, how do you fix? Normally in there types of issues, government must deal with it on a case-by-case basis. Now, if everyone wanted help, then maybe you could deal with that. But, society has deemed many ‘transients’ because they move about. They go from place to place. Now what makes so many frustrated is that they see the panhandling, tge garbage, the drunkeness, etc. Then, some folks ask for more money under the pretense that they will be helping these folks. That’s after they’ve footed the bill to clean up the local creeks and supported the local shelter. I think, honestly, most rational people would agree to building a 200 bed shelter if someone came out and said that there were 100 local homeless, plus the need for extra. But this is not the case. Many move about, many don’t want help. Some want it for only a short amount of time, others longer. Nobody is trying to criminalize this issue. But rules are rules, and we must have them to function as society. Nobody really has come up with a solution yet. Meanwhile, many of our services increase exponentially in value because we are covering those who can’t or won’t pay. I’m just stating the reasons that people view this negatively. I’m not arguing for or against. I’m just saying, based on my observations, that I’ve backed up, that SLO and other cities are by no stretch of the imagination criminalizing this. Most people would indeed like a solution, because it’s costing ask of us. Yes, numerous cities across the country are outlawing being homeless by passing laws that don’t allow you to “exist” if you don’t have a home. The laws outlaw sleeping in your car or RV (both on the street and on PRIVATE property), loitering (what you do when you don’t have a home to go to), sitting or lying down on pubic benches, taking food or bottles/cans out of trash cans, etc. These are things that people do when they don’t have a home, and our governments are making these actions that get you cited for violating the law. It couldn’t be more clear. Yes, there are many solutions. However, our government has banned them. For instance, you can’t sleep in a tent on private property, not to mention an RV. We cannot build so-called “tiny homes” of 120 to 200 square feet (city code requires housing units to be at least 400 square feet). Tiny homes would be affordable, not just to the homeless, but also to the low income folks. The list of solutions that the government prevents from happening through building codes and laws is endless. It is fascinating how many comments criticize the homeless for being mentally ill, when in my experience, this type of illness is not self-inflicted and could occur in any of us. It’s a type of “blame the victim” point of view. How do people justify this position? Some of the most severe forms of mental illness have their onset in males in the late teens through mid 20s. Examples include bipolar disorder, schizophrenia, etc. These people need our help, not our scorn and disdain, IMO. NOTE: I am not a mental health professional, and these are the facts as I understand them, but I could be wrong in some of the EXACT details, but what I stated is approximately correct. I would be happy to do more research for you in this area. I guess some people are just opposed to everything? What? Nobody wants to claim that the mentally ill homeless deserve it? That they brought it on themselves? Come on. I’m disappointed. Surely, somebody wants to make this accusation? Okay, if not the mentally ill, then how about the 12% of our homeless population that are CHILDREN? Surely, they deserve to be homeless, don’t they? Hey, we’re only talking 300 kids. Or maybe, as some here suggested, these children should be sent to PRISON…now that’s an affordable solution. Come on guys, let’s hear from you on this one. Tim, it’s not what’s right, but that’s what will happen. Those kids will end up behind bars one way or another. It has been argued that even if you have a home, what we are going to do is criminalize poverty. So if the low end working couple can become criminals, the homeless will fare even worse. Look at what Brown found out. They gave folks a $1,000 speeding ticket and a $1,000 fine when the original fine couldn’t be paid. Eventually those people gave up. The country is broken on a number of levels, and while you have a worthy cause, we have issues all over the place to address, and middle aged Men in dingy clothes will be last in line. “SloLusion”, I didn’t create this world – I just try to live in it. My parents taught me to always try and “do the right thing by my fellow man” and that’s what I do. Period. As I always tell my children: “Life is not perfect and it never will be – just do the best you can, and you’ll be okay”. Yep, I’m that simple-minded. It’s served me well so far. Peace. MIDDLE AGED MEN IN DINGY CLOTHES WILL BE LAST IN LINE. slolusion, you are certainly right in that regard. The vast majority of people I help in my own personal homeless services efforts are single men between 40 and 65 years old. Those who NOBODY will help. The reason nobody wants to create camps for the homeless is because they will look like the bottom of a litter box in about 2 weeks. Then we have to spend more taxpayer money to clean that up, just as has been spent cleaning up the creeks around SLO. I do like the idea of concentrating these people into camps for the collective good of those in need of medical and psychiatric counseling, however, Ted would say it smacked of fascism and an army tent is inadequate to house anybody in, other than soldiers. There is no easy solution, but trying to shame, criticize and cajole people into giving more when they themselves have a tough time making it here is not a part of any solution. Ted Slanders criticized some churches for not doing more and was told all the churches in all of the towns should be doing more… I guess that means everytown in the county that has a church should suffer the same burden; yes comrades, Kommissar Theodore has decreed we are all equal and therefore we shall all suffer equally from the blight of homelessness. So you people think that building a 200 bed shack is going to help this problem,all that does is create more buracratic crap to deal with,Slo city,the BOD gives enough of our tax monies to these homeless shelters and none of it does any good,housing for these bums won’t work,how they going to pay for a room anywhere,they have no job except panhandling and they smoke or drink that up. There is plenty of room out back of Cuesta Collage for a “camp”, jerk these bums and direlicts out of the creeks and bushes and instasl them in this camp not to leave it willl not be a come and go shelter, I would rather see a staff of shrinks and doctors on duty here to attempt to help these people,if some of them have a real job,they are to go back and forth for that purpose,the rest of the bums will get off the booze and drugs and get needed medical help,the ones that are able and passing thru get the boot, simple no more bums on the streets, I see no reason why we have to put up with these people. The bums who are littering the downtown area are not working at anything except getting pocket change. Some of them have become quite aggressive with females. The police can start by enforcing the laws on these people. The working homeless are another matter, presumably if they are sober enough to hold down a job they should qualify for low income housing. If there isn’t enough in this community because of its affluence, maybe they need to move to a less affluent community where cheaper housing is available. I would love to live in Carmel, but I can’t afford it. If I chuck my job and my apartment and move into my car am I now afforded some special priviledge that allows me to get subsidized housing anywhere I choose to live? If businesses can not get workers for the lowest wage possible then they will have to pay better wages. Hiring people who live in their cars, trailers, motorhomes, etc. means wages stay low for people who will never be able to live here without more government assistance. Your tax dollar ultimately subsidizes the business that doesn’t want to pay living wages. Thanks to everyone who responded in a civil and responsible manner this article on how SLO has (de facto) turned being homeless into a crime. My hope is that SLO will realize that the solution to our homeless problem is not giving the homeless more tickets that they cannot afford to pay, thus contributing to their downward spiral, and not being a constructive solution to the problem, IMO. I get the same ticket for parking my RV in front of my own home, so, this is not targeting the homeless. I don’t always support ordinances but if the camping law was not in place I could buy a cheap RV, park in front of your home and claim it as my own. Fair? The war on the middle class is the big issue. We who try and be productive citizens and are taxed unmercifully by our government to pay for everyone else’s woes while the richest skate away in loophole land. I believe we are a charitable lot, myself included. Do whatever you feel necessary to make yourself feel better without trying to pick my pocket. MY money already gets spread thin to just survive after the government takes a big cut. The system is broken when Welfare recipients have an easier life than the working class. I am amazingly comfortable with not giving any more to support the chick in front of me using her ebt welfare credit card to buy Starbucks, while wearing expensive fake salon nails, chatting on the latest iPhone she is holding with her tattooed covered hand. In the mean time I work hard sacrificing holidays and family time to make ends meet. Being that you are so compelled to hold yourself as an advocate, I suggest you take in the homeless. Lots of them, because it’s cold outside. Invite them to live with you. Give them your money and feel better. “Resident”, You are confusing 2 different laws. The one you are referring to is the law that says you cannot park ANY VEHICLE (not just RVs) in one place for more than 72 hours. This could (and should) apply to everyone. I am NOT disputing this law at all. The law I am referring to is the one that makes it illegal to sleep in ANY VEHICLE, both on a city street and ON YOUR OWN PROPERTY! When I was in college at UCLA many years ago, I worked at a political campaign computer facility in downtown LA. My shift was from 6am to midnight on both Saturday and Sunday. Because I lived near UCLA, I slept in my car for the 6 hours I was off between shifts (a 1974 Honda Civic, no less!). This would be illegal in SLO and I would get ticketed, were I to do that here…because I would be SLEEPING IN MY CAR. In later years, I worked on software development projects where I parked my RV overnight in the company parking lot, so that I could work, go out to the parking lot and sleep, then go back to work. This, too, is against the law in SLO, and if caught, I would get ticketed for this also. Again, I do not do this to feel better – I do it because the homeless are still human beings, and it is the right thing to do. I volunteer for many other causes as well – not because it makes me feel better, but because they are causes that I believe in that MAKE THE WORLD A BETTER PLACE. If you think it is easier to be homeless and live in the creekbed, than it is to have a job and live in a nice warm bed with a roof overhead, you are mistaken, my friend. If you knew anybody who lived this way, you would not make such statements. Frankly “Resident”, I already do take in homeless people. No, I do not give them money, and no, it does not make me feel better. What does make me feel better is the case of a homeless mother with 3 kids who has been in the shelter system for 2 or 3 years, and just this week, finally got into housing. THAT makes me feel better – results.